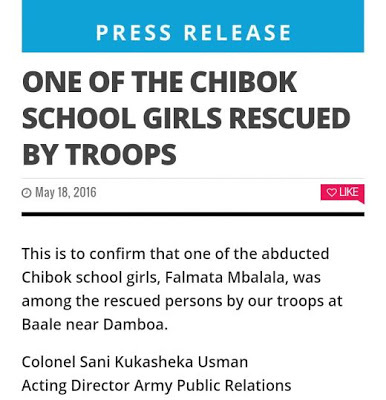 • Please recall that we informed you that one of the abducted Chibok school girls has been rescued earlier today and promised to give further details. Further to that, in continuation of Operation CRACKDOWN, troops of 25 Brigade Damboa in conjunction with Civilian JTF deployed in one of the blocking positions at Baale, near Damboa rescued one Miss Amina Ali and a suspected Boko Haram terrorist, Mohammed Hayatu, who claimed to be her husband. Both were brought to Headquarters 25 Task Force Brigade Damboa at about 2.30pm today. Preliminary investigation shows that she is indeed one of the abducted Chibok School girls abducted by Boko Haram terrorists on 14th April 2014 in Chibok and her name is Amina Ali as against Falmata Mbalala that was earlier stated. In addition, she is a nursing mother with a 4 month old baby girl who was named Safiya. Both the suspected Boko Haram terrorist and the nursing mother have been taken to Maiduguri for further medical attention and screening.